Description: These are large trees that on other islands -- mainly Kauai, Maui and Hawaii -- can grow more than 100 feet tall. They are easily distinguished by their light, flattened, sickle-shaped, modified stems (which look like their leaves). These special stems, called phyllodes, are packed with chlorophyll and take the place of true leaves in more mature plants. As a seedling, the koa plant has bipinnate compound leaves (twice as many leaflets), much like its non-native cousin, koa haole. Distribution: This endemic plant is often dominant in dry-wet forests on all of the main islands, except Niihau and Kahoolawe. On Oahu, koa is restricted to mesic forests, usually above 1,000 feet. It was probably found in much lower elevations in the past. Landscape use: Koa trees are beautiful shade trees. Many people believe koa can only grow at high elevations, but that is a misconception. We have one planted in Waimanalo -- maybe 30 feet above sea level -- and it's doing great! Another misconception is that it will become too large. Yes, koa can be a large tree, but those trees are hundreds of years old. 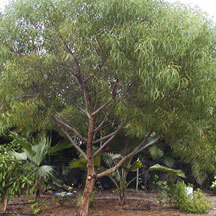 Trees such as monkeypod or albezias are much larger and faster-growing. Generally, koa trees in landscapes will be 20 to 30 feet tall. Koa is easy to take care of and requires little watering once established. The only pests you should worry about are stem borers. If you see a stem or branch beginning to dry out, immediately cut it off to prevent the bug from boring deeper. You can buy a decent-size koa tree for only about $9 at either Home Depot or our nursery in Haiku. Tasty tidbit: Koa wood is highly valued, used to make items from canoes to hair picks. Today, because of the increasing rarity of native plants, perhaps we should find alternative (non-native) trees for making our belongings. Why not make something out of an invasive alien tree, such as java plum, cook pine, kiawe or strawberry guava, all of which also have beautiful wood? By doing this you do your part to preserve Hawaii's native forest treasures.